For many people, Ecuador is a dream come true because of its spectacular nature. And indeed, the Galapagos Islands and Ecuador’s national parks are so beautiful that it’s no wonder they are considered to be some of the world’s best travel destinations. But Ecuador is also home to something else that is the best in the world. It’s raw, it’s organic, it tastes like heaven, and everybody loves it. I’m talking about chocolate. Over the last few years, Ecuador’s gained a reputation for having the world’s best chocolate. Since 2012, this small South American country has been receiving a gold medal from International Chocolate Awards in Dark Plain/Origin Bars category each year. And for a good reason – Ecuador has some of the oldest varieties of cocoa trees, and chocolate, just like wine, reflects the origin of cocoa beans in its flavour. While Africa has been the main exporter of cocoa beans for a long time, it is in Ecuador where they are of the highest quality. In fact, the country has been exporting the “black gold” long before Africa. In 16th century, Hernan Cortes was introduced to a spicy drink called ‘xocolatl’ by the Aztec ruler Montezuma. The Spanish conquistador, in turn, introduced the drink to European society, where, with just some addition of sugar, it became a real success. And because Ecuador didn’t have as much gold and silver as other South American lands, it was mainly exploited for its cocoa beans. However, in the beginning of the 20th century, Ecuador faced a severe plant disease, which negatively affected the cocoa production. Moreover, the British and the French introduced new cultivations across their colonies in Africa and Asia, so Ecuador was no longer relevant in the cocoa market. The country started exporting banana and coffee beans instead. 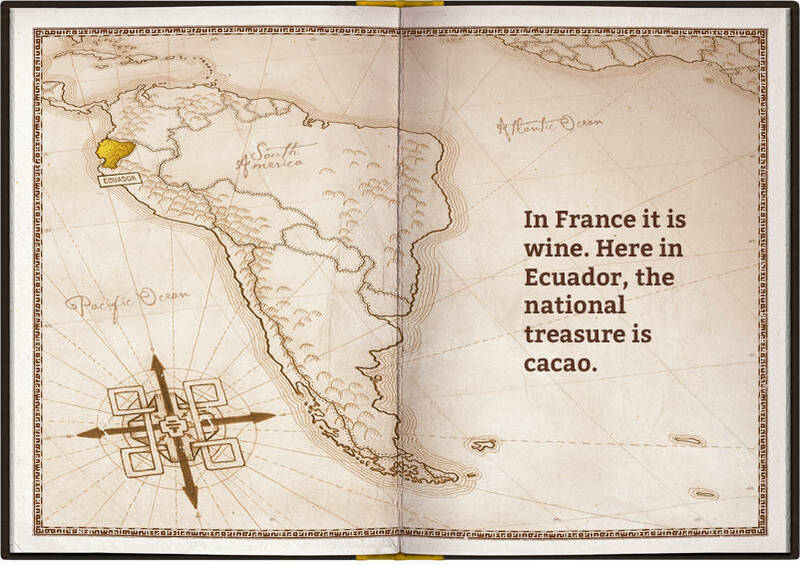 But over the last few decades, the world remembered that there are some super-high quality cocoa beans somewhere in South America, so Ecuador reappeared on the chocolate stage. However, exporting cocoa is one thing, but making prime quality chocolate is another. Having the world’s best cocoa beans, Ecuador still didn’t know how to make excellent chocolate out of them. Some Ecuadorians say that their chocolate didn’t even taste that good before. But in 2002, Santiago Peralta and Carla Barboto, a husband and wife, developed Pacari Chocolate which is the finest organic chocolate made entirely in Ecuador. Their dark plain bar – Montubia 70% – has won numerous awards by this point, is sold in over 25 countries worldwide, and has even beaten Swiss chocolate in quality. Having made a strong name for themselves among the world’s most proclaimed chocolatiers, it also greatly helps common Ecuadorian farmers who benefit economically from such international success. Living in a country like Ecuador – especially in Esmeraldas, an Ecuadorian province that now produces prize-winning chocolate but is still as poor as it ever was – chocolate gives hope to many people and helps them build a brighter future. Why are cocoa beans from Ecuador so special? What makes Ecuadorian chocolate the best in the world is the Arriba cocoa beans, also known as Arriba Nacional, Nacional Arriba, or simply Nacional. These cocoa beans are considered world’s best, and are the reason why the local chocolate tastes so unique. Every bean differs in aroma according to the area of where it was grown. Because of Ecuador’s geographical diversity, some beans may have a fruity flavor, while the others can have more of a nutty taste. Such variety in Arriba beans makes Ecuadorian chocolate unique. The origin of the word arriba has its own legend. They say that about a century ago a Swiss chocolatier was travelling on a boat through the Guayas river, that goes through Guayaquil, Ecuador’s largest city, when he saw another boat transporting cocoa beans. Completely blown away by their aroma, he asked where the cacao came from and received an answer: río arriba, which meant ‘up the river’. This is where Arriba started its course of becoming the world’s best cocoa beans. Now there are more and more companies that produce all-natural and 100% Ecuadorian chocolate, making Ecuador a country to be proud of. Ecuador is now well-deservedly labelled as the place which makes the world’s best chocolate. And hopefully, it will only continue to get better to further improve the life of cocoa farmers in the country and satisfy the tastes of chocolate gourmets around the whole world. Traditional Latvian Cuisine: What’s In The Menu? I lived in Ecuador most of my life. I also spent 3 yrs in Venezuela (presumably home to the best white chocolate on earth). When comparing cocoa, I would not dispute that Ecuador might have the best beans (I haven’t performed an objective tasting). When comparing chocolate, I think Ecuador still has a way to go. Their chocolate tends to be coarser tan swiss or belgian (at the same % of cocoa). I think it has to do with conching or other parts of the process. Still, it is a source of pride to have become so recognized in recent years. Regarding your history: coffe and banana might have overshadowed cocoa but oil might have played a bigger role, as it became (and still is) the country’s most important source of income. Oh, I never knew that Venezuela is supposed to have the best white chocolate in the world. Is it really that good? I’m not a chocolate expert, really, but maybe the coarseness of Ecuadorian chocolate has to do something with the beans themselves? Maybe Swiss or Belgians give preference to different kinds of beans (I don’t know, though, I’m just assuming). I really like the bitterness of the chocolate, though. I think it gives it such an incredibly unique character! And you’re absolutely right about oil – Ecuador highly relies on exporting it! This looks like my kind of place. I absolutely adore chocolate!